The Hotel Gabriella is a 3-star hotel in Torre Pedrera, a few steps from the beach and complete with swimming pool with hydromassage, invigorating shower and solarium with beach umbrella and sunbeds. The structure has a game room, services for children, parking. It admits small pets. The hotel is just a few steps from the Torre Pedrera beach and the promenade, near the train station. This seaside town is located north of Rimini and can be easily reached by car by exiting the motorway at the Rimini nord tollbooth. All the rooms of this hotel have: balcony, air conditioning, WI-FI connection, satellite TV, private bathroom with hairdryer, safe and telephone. CLASSIC: room with all the comforts listed and plus LED TV with USB 2.0 socket. SUPERIOR: room more elegant than the previous one always with LED TV but with a balcony overlooking the sea. FAMILY SUITE: completely renovated solution with adjoining room accessible from the inner door, double balcony with sea view and TV, fridge and large bathroom with shower box. FAMILY ROOM: solution consisting of two connecting rooms with independent entrances. Balconies, televisions, bathrooms, safes and air conditioning units are all double services. JUNIOR SUITE: two rooms with communicating living room and a large bathroom with shower box. All the services previously listed are present. PENTHOUSE: large room with private balcony of 35 square meters and sea view. All the comforts listed in the previous solutions are present but inserted in a refined furnishing environment. Swimming pool in an adjacent area, heated Jacuzzi, massage shower, solarium area with beach umbrella and sunbeds, terrace, large adjacent playground area, bike rental, lift, reading room, fitness room, beach towel in use, coin-operated washing machine. PARKING: uncovered and free, adjacent to the hotel; garage on request for a fee. AIR CONDITIONING: both in the common areas and in the room. AGREEMENTS: beach, amusement parks, shuttle service, organized excursions. BREAKFAST: international buffet breakfast with homemade cakes, brioche, cakes, cold cuts, eggs and cheeses. LUNCH AND DINNER: the kitchen, taken care of directly by the owners, offers 2-choice menus with meat, fish and homemade desserts as dessert. Soft drinks are included in all formulas, wine only in all inclusive. CHANGES: the kitchen offers vegetarian dishes. In the hotel: children's pool, 100 sqm playground area adjacent to the hotel, entertainment, baby / mini / junior club, strollers, bicycles with seats, baby sitter and pediatrician. At meals: bottle warmers, high chairs in the restaurant and baby menus agreed with mothers, baby food, bottle warmers. Guests have access to a pool of 80 square meters at varying heights (50 to 140 cm). At its side, an 8-seater heated Jacuzzi, a massage cervical shower and a waterfall. The solarium area, which surrounds the two pools, is equipped with sun beds and beach umbrella. There is no playground area for children. 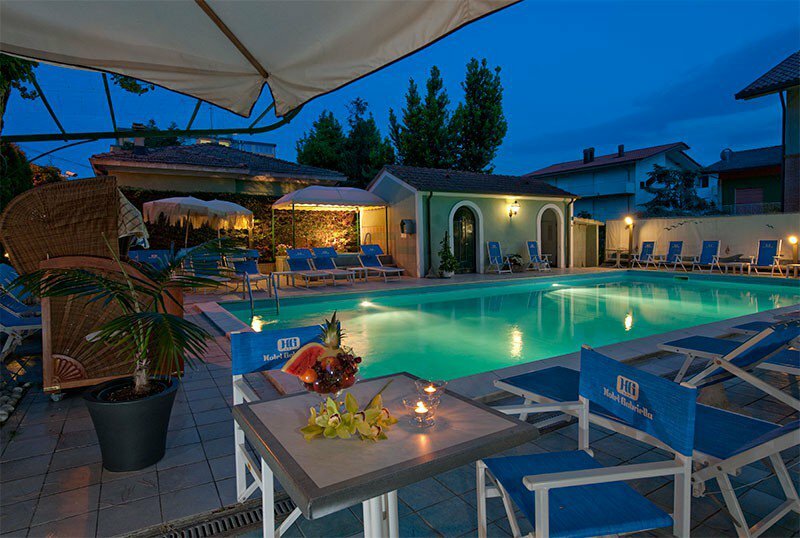 The hotel has an agreement with Bagno Rinato n. 68/69 modern and elegant establishment, equipped with a children's playground area, beach volleyball courts, beach tennis and five-a-side football fields, fitness area and hydromassage baths. All Inclusive prices are per person for 7 days. Prices for full board and half board are per day per person. - For the final confirmation, we require the payment of a deposit.